Howdy folks! Artsy Guy here in Southern California, visiting pals and catching up on the old neigborhood(s). The last post was from Northern San Diego County. For this installment, I dropped into a couple places a bit further north. 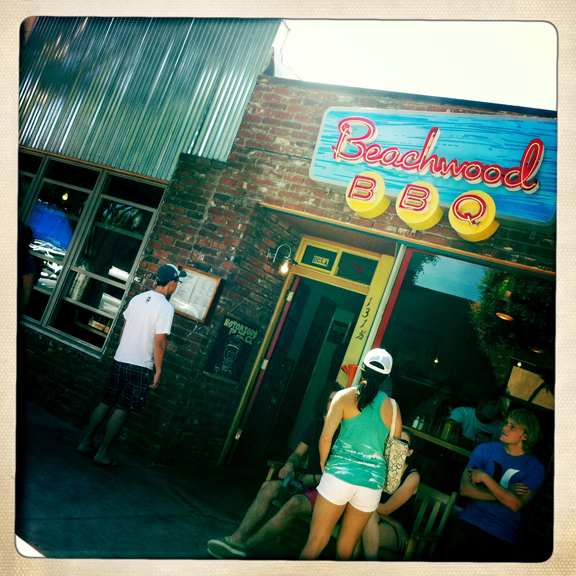 First... Beachwood BBQ in Seal Beach. Beachwood BBQ on Main St. in Seal Beach.This is hovering there at the top of my list of favorite beer bars in Southern California. 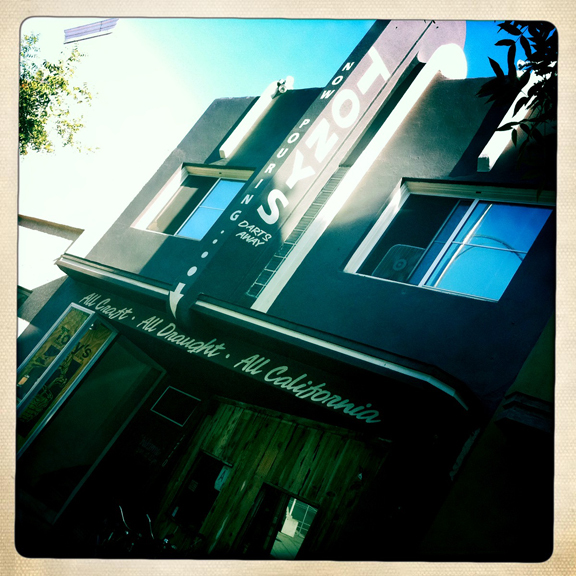 Cozy, friendly, and laid back... with fantastic food and a brilliant rotating beer selection. At their website, be sure to click on the "Hop Cam" which periodically captures a photo of their chalkboard wall. Such a brilliant way of updating folks on the current draft list. (HHG Mark suggested I try to photo bomb one of the shots, but I couldn't figure out when they happened. Anyhoo...) Some other cool things about this place: They recently opened a brew pub just a hop north in downtown Long Beach. The BBQ is delicious, and while they have traditional favorites (pulled pork, ribs, etc. ), they also have a cold smoking process that results in menu items like my snack of choice on this visit... the blackened ahi sashimi. And probably my favorite geeky pleasure at this place, owner Gabe's "flux capacitor" which allows each tap to be customized to optimal brewer specifications. Neat. And it's just a block or so away from the Seal Beach pier. I love this place! Beachwood BBQ's bar, blackened ahi sashimi, and the "flux capacitor." Tony's Darts Away.Next, I wanted to try someplace that was new to me. A lot can happen in a year and a half, and while I've been away, this place sprung up in an old neighborhood watering hole rather near my last apartment. Tony's Darts Away in Burbank is another example of a beer bar done right. Their beer concept is "All craft. All draft. All California", celebrating California's many contributions to the craft beer revolution. For example, the west coast IPA style hails primarily from Cali, and Tony's draft menu is categorized as "IPAs" and "Not IPAs". It's not necessarily fair to other beer styles, but it makes this Guy incredibly happy. I didn't get a chance to try the food, but it looked great. Sausages and salads and fried things... including a lot of choice for vegan folks. They also strive to be a no-waste bar and a low-waste kitchen, admirably striving for a small carbon footprint and encouraging sustainability. It's the only way I want to experience green beer. Ha! I made a funny. Tony's Darts Away.Anyhoo... the folks at Tony's Darts Away also recently opened Mohawk Bend in Echo Park, featuring 72 taps and the same standards featured at Tony's. Sounds like they're doing it up right. I think I have one more post on the way from this trip. I'll likely not be able get to all the ol' haunts, but that doesn't mean I can't list a bunch that any of you Cali residents and visitors can check out. So, for now... that's what's HOPpenin' y'all! Cheers! Video #98: Breckenridge Brewery and BBQ - Family. The Breckenridge BrewMobile enables a triumphant return to Breckenridge Brewing's Main Brewery at 471 Kalamath Street in Denver for Jimmy and Mark.